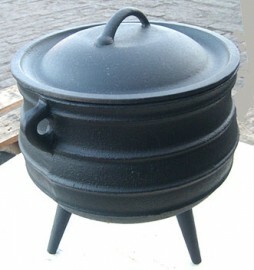 The Size 25 Potjie Pot includes well-fitted lid and carrying handle. Pre-seasoned with flaxseed oil and made from pure gray cast iron. Our largest size Potjie Pot and in heavy demand by outdoor patios, BBQ businesses, church groups and even for outdoor planters. Height: 20.0" Width: 22.0" Capacity: 18.75 Gallon Weight: 160 lbs Requires Truck Shipping Contact us for shipping quote.